Motojournalists lined up to heap praises upon Yamaha’s FZ-09 when it appeared as a new model for 2014, and MO was right there on the bandwagon. There wasn’t anything not to like in the all-new 847cc Triple, with all the modern ride-by-wire trimmings in a designer chassis, for a price substantially less than its Euro-competitors. 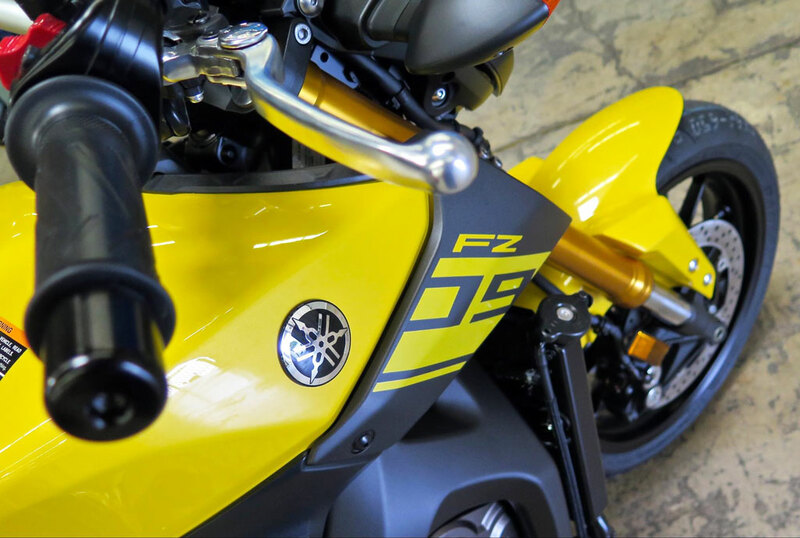 The FZ-09 is fitted with the Yamaha Chip Controlled Throttle (YCC-T) ride-by-wire system, a technology incorporated on several of its previous models, making it even more remarkable how the company could fail when it comes to two out of the three ride modes available. But that’s not to say the FZ’s motor wasn’t appreciated. “The FZ-09 was one of my favorite new motorcycles of 2014, but its abrupt throttle response – especially in its top A ride mode – spoiled what had the potential to be a stellar and desirable new Triple. It was plainly unrefined for something from a Japanese OEM. 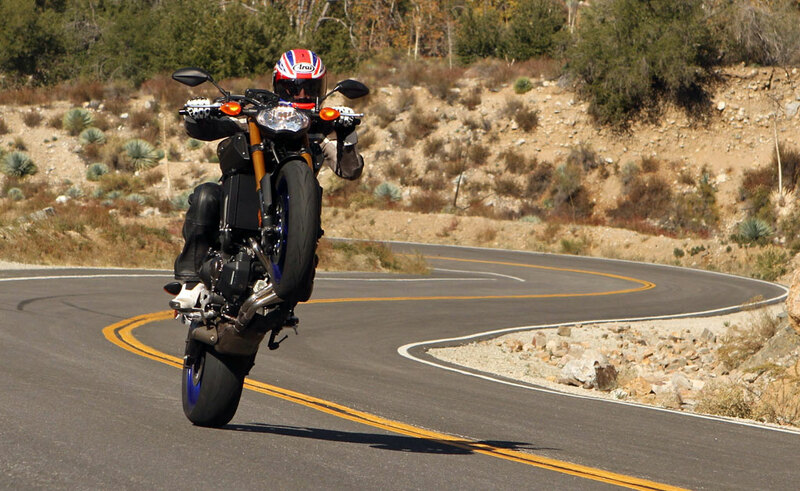 The new mapping dramatically attenuates the FZ’s rough edges when applying throttle. The Standard (middle) mode has been tamed to respond like an engine with just one mode, presenting intuitive reactions. The new A mode feels similar to the Standard mode of 2014, perhaps even less jumpy. Yamaha remapped the bike’s ECU and removed nearly all of its jerky on/off throttle response, though what exactly it did Yamaha says is proprietary information. Where at times the ’14 model had a difficult time even maintaining a steady speed, on the ’15 that’s all been cured: The new bike responds to initial throttle much more smoothly in Standard mode, and now “A” mode is more useable, though most of us still prefer STD for even sporty backroad riding. That’s mostly because what Yamaha didn’t address for 2015 is the bike’s softish suspension, which encourages you to be as graceful as possible with throttle inputs. With more controlled suspension, A mode would be more useable, but then again, the FZ wouldn’t be such a comfortable ride around town would it? Other than new colors, Yamaha says the ’15 FZ is unchanged. The Bumblebee-inspired Cadmium Yellow is sweet indeed, MSRP is $ 8,190. A dealer in New Jersey said he could do the upgrade for free if the bike falls into a certain range of VIN numbers, but to call back next week because he’s having computer problems. A Yamaha dealer in Houston told me there’s no way to do it unless the bike has a Power Commander on it (? ), and that reflashing stock ECUs is not a thing dealers do. A local dealer here in California backed up the Jersey version: Once he sends the bike’s VIN off to Yamaha, he’ll know if the ECU has already been upgraded, and if not, the reflash is a freebie that shouldn’t take more than an hour to perform. Apparently, some ’14s got the good map and some didn’t – and Yamaha doesn’t want to waste an hour of dealer time if your bike already has the good one but you’re easily suggestible. Sounds reasonable. Here’s to good dealers and to Yamaha doing the right thing. The FZ-09’s a great motorcycle, and so is the FJ-09 which shares the same engine, and which won our last Japanese Adventure Bike Shootout here. May the triple theme continue. Other than the ’15 bike’s smoother throttle response, performance is basically unaffected. Side-by-side top-gear roll-ons revealed identical performance between the two bikes, backed up by a quick pull on the MotoGPWerks dyno, where the two bikes are within a few ticks of each other. It should be noted the 2014 FZ we tested had about 4,000 miles on it, while the ’15 model was a much tighter mill with less than 300 miles on it. Both bikes run into a rev limiter at 10,000 rpm in fifth gear (118 mph), but pull all the way to the 11,300-rpm redline in fourth (128 mph). 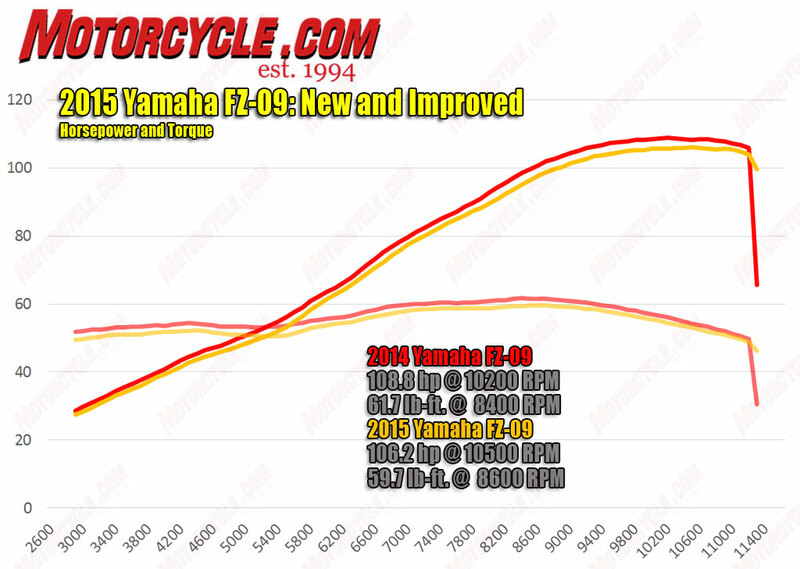 2015 Yamaha FZ-09: New and Improved Fuel Injection! appeared first on Motorcycle.com.